on rainy days and california sun. There's no question that I am a complainer. I honestly try not to, but we all know it happens. Especially when it comes to rain. So here I am on a Sunday night (yes, I do schedule my posts still), going through my photos, editing some and watermarking them along the way. And while I wish I had some quirky/clever thing to say right now, I'm a little brain dead to tell you the truth. I spent the morning with preschoolers. That's my excuse. If you read my instafriday post (posted yesterday) then you probably noticed that I walked around and looked like the Easter rabbit. Yep, pretty embarrassing now that I think about it. Anyway, here are a few photos from the family road trip down to California for spring break. I managed to take like a hundred photos on instagram which is great except for the fact that I now regret not using my Canon since sharing those photos seem to look better on the blog. Side note: does anyone have any tips for posting instagram photos on blogger? Anyone? Okay, okay. I'll stop writing and start showing. For once. I took TONS of photos at my grandparents' house. For some reason instagram catches the magic in old things. I love the filters. Especially Nashville (used for the lemon tree and watermelon pot holder photos). I also managed to eat a lot. As in a lot a lot. And yes, that included this year's dosage of sugar and red food coloring courtesy of Sonic's cherry limeade slush. The maraschino cherry was delightful, too; thank you very much. I also spent time in my grandpa's garden. Not only is he a bird lover (he builds nests for doves who have a serious deficiency in that department) but he can also grow just about anything. I also managed to escape being stung by a crazy amount of bees (never been stung!). One of the bumblebees in the lemon tree was GIGANTIC (like the size of my thumbnail). And that's coming from a girl who has pretty big fingers. You better believe I went to IKEA. Being a college student meant giving myself a measly ten dollar budget and somehow managed to stick with it. Yes, I got this one off my wishlist. The other I just couldn't do without (I dragged my family to go through the maze--aka IKEA's floorplan--just to get a darling tray that isn't even on their website. Can I get a collective FAIL?). Okay, that's it. I realize I didn't take many photos this year because it was so darn rainy. Okay, I'll stop complaining. But seriously, when is the sun coming to stay? And yes, that is coming from a girl who loves the Pacific Northwest. p.s. 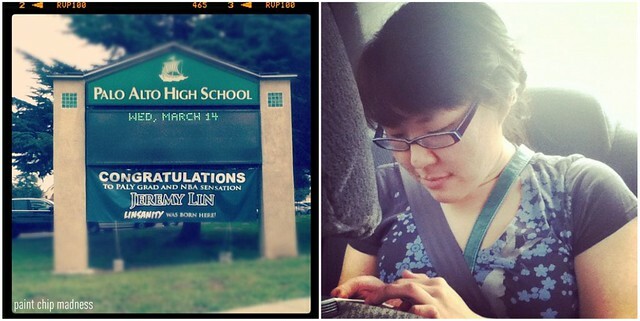 I also got to see Jeremy Lin's high school (the photo on the right is of me editing the photo). That makes me semi-cool, right?